Anyone with access to your hard drive can recover the data in your deleted files, FolderShredder uses the best method to make it impossible to recover deleted files: Overwrite over and over on alternate patterns, Rewrite files in binary mode, Shrink files, Rewrite again and Encrypt, Rename and Delete. This helps you take control of the information you don’t want anyone else to get their hands on by permanently removing the files. Permanently remove from Hard Disk or removable media any sensitive digital information from your computer such as documents, music, videos, photos, software and more. The US department of Defense has created a standard called DOD 5220.22-M. It encourages rewriting file contents up to 20 times to make it completely unrecoverable. Windows® doesn’t delete files even if you empty the recycle bin or format your HDD, so it’s important to make irrecoverable sensitive data that should not be recovered by other people whit recovery tools. 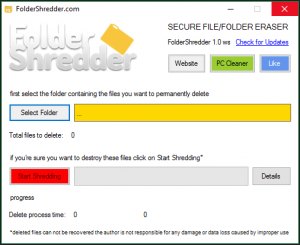 FoldeShredder does not require installation, is a Free portable file shredder program with several data wipe methods. You can delete alla files in a Folder with One-Click.